The Atkins clan visited the Land of 10,000 Lakes this week. We stayed very busy and had lots of fun all without visiting a single body of water. We arrived on Tuesday afternoon and went straight from the Humphrey Terminal of the Minneapolis-St.Paul International Airport to Target Field, home of the Minnesota Twins. 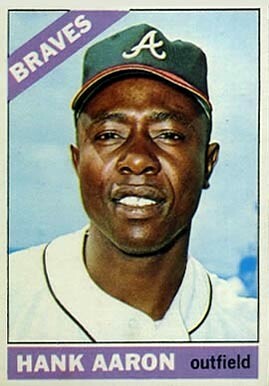 The Twins arrived in Minnesota in 1961; they are the original Washington Senators franchise. The American League expanded in 1961, adding the Los Angeles Angels and a new Senators team in D.C. Although the team is named for the Twin Cities of Minneapolis and St. Paul, the Twins of Blyleven, Carew, Cardenas, Grant, Killebrew, Kaat, Oliva, and Versalles played their home games at Metropolitan Stadium in Bloomington, Minn. through the 1981 season. In 1982 they moved across the river into Minneapolis where the Twins of Gaetti, Hrbek, Puckett, and Viola played their home games in the Hubert H. Humphreys Metrodome, possibly the worst baseball venue in the history of the game. 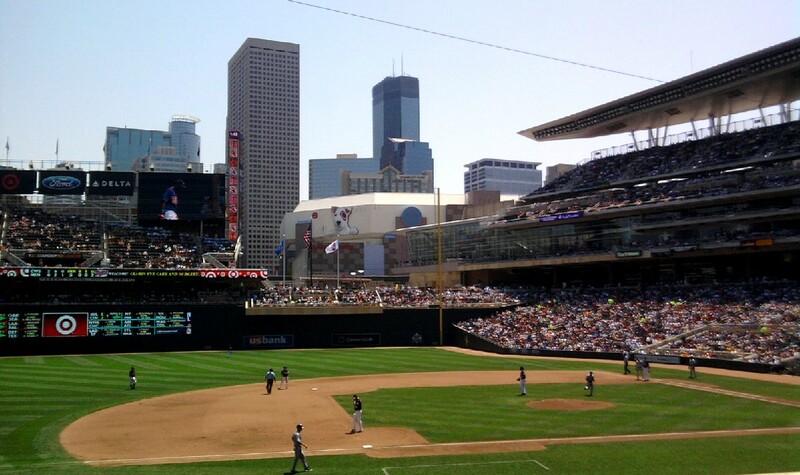 The Twins are in their second season at Target Field, a beautiful park located in the downtown warehouse district of Minneapolis. It is a cozy ballpark, especially for left-handed hitters. The right-field corner is 328 feet from home plate and the alley in right-center is only 365. The wall in right field is 23 feet high, but it doesn’t make up for the shallow power alley. The distances in left field make it a bit more challenging for right-handed hitters. It is 339 feet down the line and the wall is 411 feet at its deepest part, just left of center field; but the power alley in left-center is just 377 feet from home. The park has a grand view of the Minneapolis skyline and the light rail runs all the way from the airport to the main gate of the stadium. We were watching the game closely and no one in our party saw De Aza flap his arms, take flight and land in center field. The proper baseball vernacular for a flyout to center is “flied to center,” with the “out” being implied. 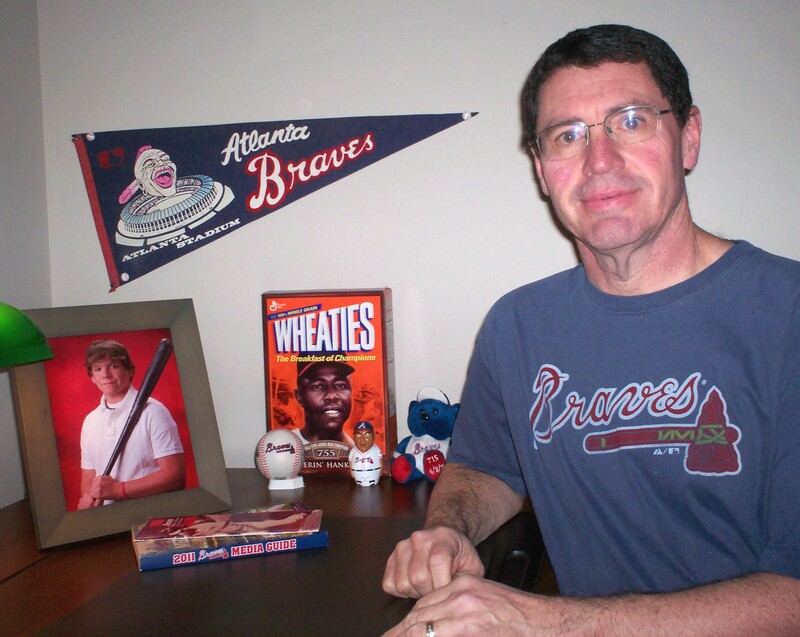 I was contemplating an e-mail to someone high up in the Twins’ organization, but during Wednesday’s game after Kevin Youkilis flied to center in the first inning, the big screen reported, “Youkilis flied out to center field.” Someone else must have gotten to them before I could. We saw two games at Target Field and the Twins lost both of them; the White Sox beat them 3-2 Tuesday evening and then drubbed them 12-5 on Wednesday afternoon, banging out 21 hits in the process. After our visit to Target Field, the Twins were in the cellar of the American League Central Division, nine and a half games behind the first-place Sox. So I suppose the higher-ups in the Twins’ organization have bigger fish to fry than worrying over the big screen reporting batters who “flew” out to center field. On Thursday we drove down Killebrew Drive in Bloomington to the site where Metropolitan Stadium once stood. The stadium is long gone but the site is far from vacant. The Mall of America, featuring over 400 stores, the Sea Life Aquarium and Nickelodeon Universe now occupies the area where Killebrew once thrilled crowds with his long home runs. I have never been one who likes to spend my days at the mall, but the Mall of America is more of a tourist attraction than simply a shopping center. 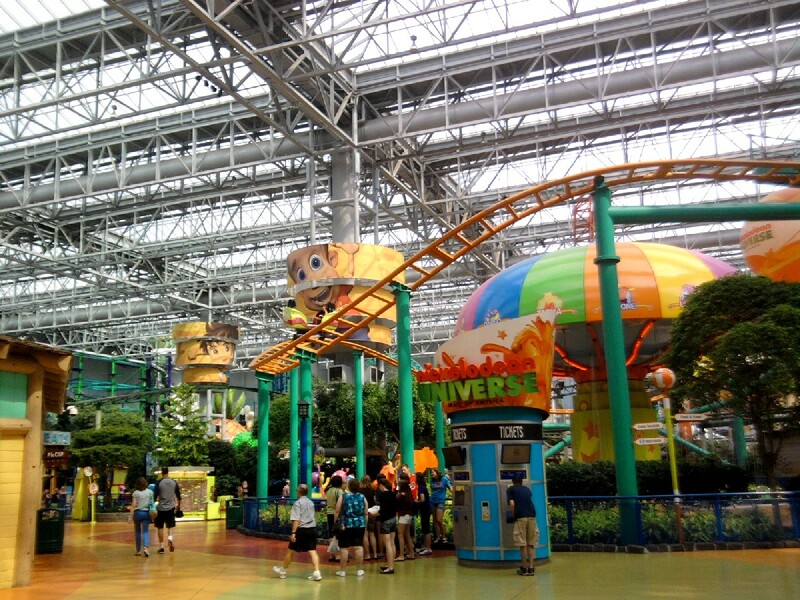 We did our share of shopping, but we also took in Nickelodeon Universe, which is smack-dab in the middle of the mall. We strapped on some harnesses, tethered ourselves to some steel beams and walked on swinging bridges and cables, working our way to a platform up at the fourth-floor level of the mall. We zoomed back down to the first level in a winding tube slide; I left half my kneecap on the wall of the first turn, but it was fun anyway. We then decided to try the SpongeBob SquarePants Rock Bottom Plunge. Our son, Sean, was seated to my left; to my right was a boy about 10 years old who started talking as soon as they secured us into the coaster. He saw me hand my Nook to the attendant for safe keeping during the ride so he proceeded to sing the praises of his new Kindle Fire. The roller coaster starts out by turning 90º and climbing straight up toward the roof of the mall. During the 67-foot climb (that’s what the brochure says; it seemed more like 100 feet to me), the 10-year-old told me his mother also had a Kindle Fire and that he had heard that the SpongeBob SquarePants Rock Bottom Plunge was the best ride in the city. We reached the apex, went over the top and dropped straight down (actually the drop was 97º, but who’s counting?). I had to assume we were still on the track since we lost sight of it until we reached the bottom, which in reality left us only about 1.5 seconds to assume anything. We survived the drop, zoomed around sideways and upside down for a little more than 45 seconds and the ride was over. It was one of the best roller coasters I’ve ever ridden, despite the fact that a 10-year-old boy screamed in my ear the whole time. Next we decided to try the Pepsi® Orange Streak roller coaster. It was a good ride, but after the SpongeBob experience, it was a bit of a letdown. In retrospect, we should have ridden the Orange Streak first. After spending the entire day at Mall of America, we drove 10 miles over into St. Paul and stopped at the Fitzgerald Theater, home of “A Prairie Home Companion” with Garrison Keillor, produced by American Public Media and heard on most National Public Radio stations. The Fitzgerald Theater bills itself as St. Paul’s oldest theater and celebrated its 100th anniversary in 2010. According to its website (http://fitzgeraldtheater.publicradio.org/about), it was built in 1910 and originally was named the Sam S. Shubert Theater. Minnesota Public Radio purchased the theater in 1980 and remodeled it in 1986 for “A Prairie Home Companion.” They renamed it in 1994 for writer F. Scott Fitzgerald, author of The Great Gatsby, who was born in St. Paul on September 24, 1896. Keillor currently has “A Prairie Home Companion” on the road and it airs on Saturday evenings. Since we were leaving Minnesota on Friday, we would not have been able to see the show even if it were in town. 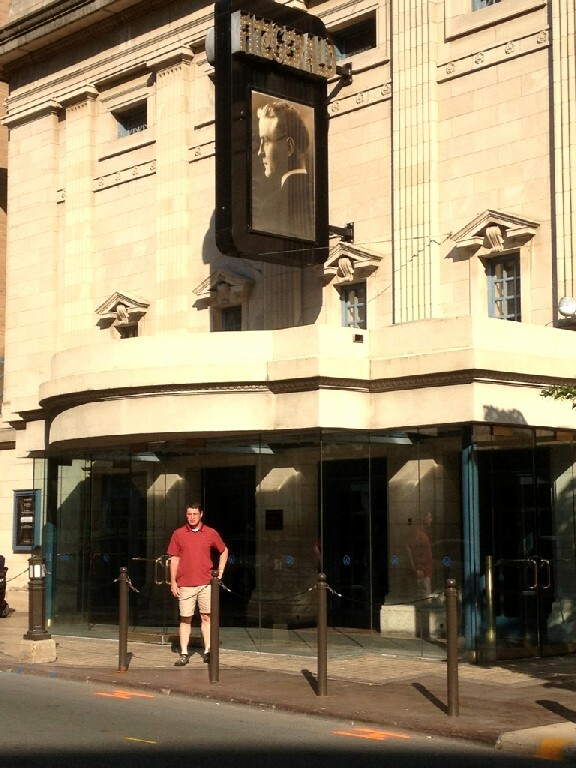 I had to settle for having Sean take my picture out in front of the theater. We had great weather for our entire trip, saw some big league baseball, rode some roller coasters and visited a historic theater. All in all I would say it was a very good trip and one I recommend to anyone. Sounds like the clan had a great time… glad y’all made it home safely. The heat in Nashville hit us as soon as we walked out of the airport. I don’t think it got above 85 the whole time we were in Minnesota. Quite a contrast.